Hampshire coach Dale Benkenstein says the door is not closed to Jimmy Adams returning as captain of the county's four-day team. 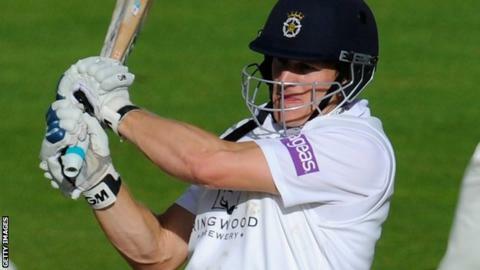 Adams, 34, stood down as County Championship skipper on Saturday to focus on his batting. One-day captain James Vince has taken on the role on an interim basis. "Jimmy wants to get back into form. There's no long-term plan and we're just going to take it game by game," Benkenstein told BBC Radio Solent. Benkenstein admitted Adams had been considering the decision for a while, with the left-handed opener also in the middle of his benefit year. "With that and opening the batting in every format of the game, I could see that it was taking its toll on him," added Benkenstein. "After the defeat at Worcestershire, we had a chat and thought it would be an option, especially if he wasn't going to do it next season. "He took a few days to think about it and felt it was probably the right thing to do." Hampshire currently sit bottom of Division One of the County Championship, having been promoted as Division Two champions last season. Meanwhile, all-rounder Sean Ervine has suffered a setback as he continues to recover from a broken finger sustained against Somerset in June. The 32-year-old was expected to have an X-ray on Monday but revealed it will now not take place until 10 August. "I'll start doing some gym work this week with a view to having a bowl next week," he said. "It's just the batting that's going to be a problem."